As I shared yesterday, Saffy is really the piggy in the family. She wolfs her own chow and then goes after everyone else's. 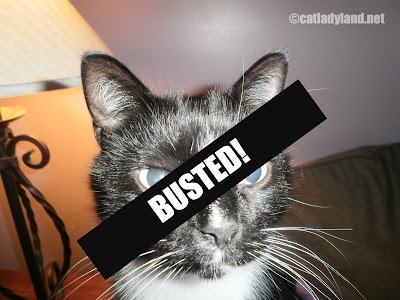 I did, however, bust one certain tuxie individual with his snout in Phoebe's food. This time Cosmo can't deny it. Thanks to the magical 6-seconds of auto-edited wonder that is Vine, I captured it all. And watch how he sulks away. So busted.